The Bug Nebula, NGC 6302, is one of the brightest and most extreme planetary nebulae known. At its centre lies a superhot, dying star smothered in a blanket of hailstones. 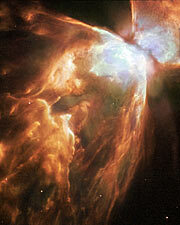 A new Hubble image reveals fresh detail in the wings of this cosmic butterfly. This image of the Bug Nebula, taken with the NASA/ESA Hubble Space Telescope, shows impressive walls of compressed gas, laced with trailing strands and bubbling outflows. A dark, dusty torus surrounds the inner nebula (seen at the upper right). At the heart of the turmoil is one of the hottest stars known. Despite a sizzling temperature of at least 250,000 degrees C, the star itself has never been seen, as it is hidden by the blanket of dust and shines most brightly in the ultraviolet, making it hard to observe. 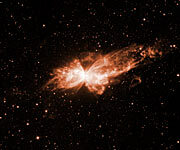 Chemically, the composition of the Bug Nebula also makes it one of the more interesting objects known. Earlier observations with the European Space Agency's Infrared Space Observatory, ISO, have shown that the dusty torus contains hydrocarbons, carbonates such as calcite, as well as water ice and iron. The presence of carbonates is interesting. In the solar system, their presence is taken as evidence for liquid water in the past, because carbonates form when carbon dioxide dissolves in liquid water and forms sediments. But its detection in nebulae such as the Bug Nebula, where no liquid water has existed, shows that other formation processes cannot be excluded. Albert Zijlstra from UMIST in Manchester, UK, who leads a team of astronomers probing the secrets of this extreme object, says: "What caught our interest in NGC 6302 was the mixture of minerals and crystalline ice - hailstones frozen onto small dust grains. Very few objects have such a mixed composition." The dense dark dust torus around the central star contains the bulk of the measured dust mass and is something of an enigma to astronomers. They believe the nebula was expelled around 10,000 years ago, but do not quite understand how it formed and how long the dust torus can survive evaporation by the now very hot central star. Stars like the Sun end their lives ejecting much of their gas into space. The gas ejections happen over relatively short timescales, from 1,000 to 10,000 years, and form some of the most beautiful objects in the night sky - the planetary nebulae. The Bug Nebula lies in the southern constellation of Scorpius and its distance is estimated to be about 4000 light-years. This Hubble image is composed of two WFPC2 (Wide Field and Planetary Camera 2) exposures: a 610 second exposure through an H-alpha filter (shown in blue) and a 470 second exposure through an ionized nitrogen filter (shown in red). The nitrogen (red colours) is especially abundant in the outer regions where the gas is coolest. The study based on the HST image and observations with ESO's Very Large Telescope and the JCMT on Hawaii is submitted to the European journal Astronomy & Astrophysics. The detection of carbonates in NGC 6302 was made by Ciska Kempers, of the University of Amsterdam, and was published in 2002 in Nature, 415, 295.